The Indigo family of thermal interface solutions (TIMs) are precision engineered Phase Change Metal Alloys (PCMAs) for professional, high-end applications pushing the heat flux envelope. With excellent surface wetting and high bulk conductivity, Indigo TIMs offer dramatically lower thermal resistance than competing products. 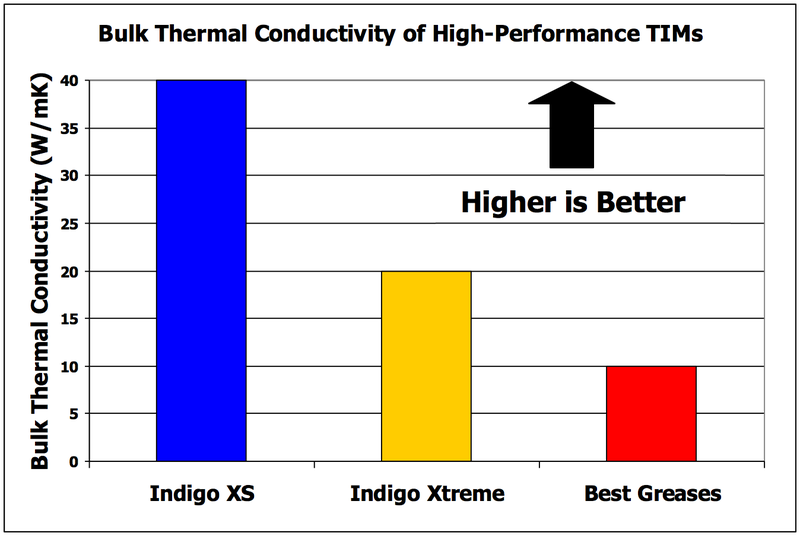 It can been seen in following graph that Indigo Xtreme and Indigo XS possess 2X and 4X (respectively) the bulk thermal conductivities of the best aluminum and silver-filled greases and pastes. 1. Indigo XS: IBM Corp, "Metal TIMs for High Power Cooling Applications", IMAPS Symposium 2005. 2. Indigo Xtreme: Indium Corporation, Indalloy Datasheet, 2013. 3. Best Greases: Selected TIM vendor datasheets. The overall thermal interface impedance/resistance is the sum of the bulk resistance (inverse of bulk thermal conductivity) and contact resistances (both interfacial surfaces). Therefore, for the lowest overall thermal impedance, the bulk thermal conductivity must be maximized and contact resistance must be minimized. The graph below (ASTM D5470 thermal resistance test results) illustrates the contribution of the bulk thermal resistance and contact resistances for high-performance TIMs. The Indigo family of TIMs achieves low contact resistance through the optimized deployment of highly conductive PCMA, thereby filling the surface micro-asperities on the CPU lid and cooler. The combination of low contact and bulk resistance result in the lowest total thermal resistance of any TIM available. With increasing CPU wattage (resulting from overclocking), the temperature rise across any TIM increases. This results in higher core temperatures and degraded CPU performance. For users who operate at stock wattages and frequencies, the performance difference between most high-performance TIMs may be immeasurable. Therefore, a regular thermal grease or paste would be adequate. However, for the thermal professional or extreme enthusiast who is operating outside the stock performance envelope, the Indigo family of TIMs would provide a significant advantage at these higher wattages. 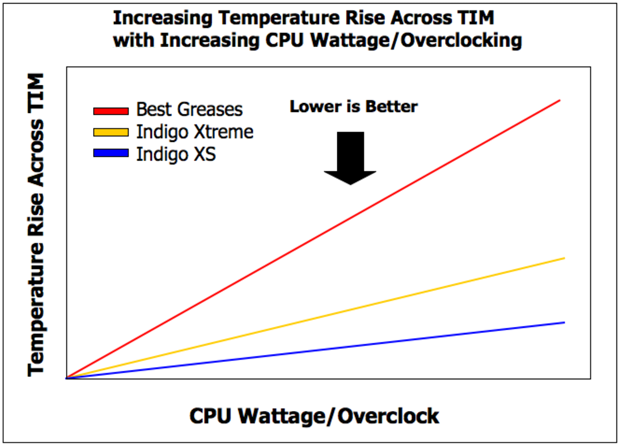 The qualitative graph below illustrates the relationship between total TIM thermal impedance and increasing wattage/overclocking. It can be seen that the temperature across the best grease TIMs rises sharply with increasing wattage. However, the ultra-low thermal impedance of the Indigo TIMs results in a slight temperature rise. This performance advantage translates to lower overall core temperatures, higher overclocking frequency, increased thermal stability and reliability. 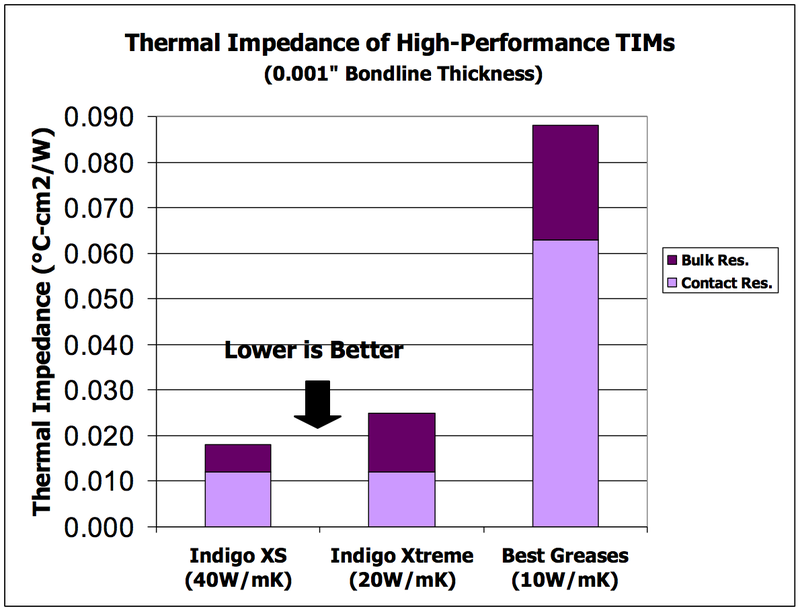 The Indigo engineered thermal interface solutions are the clear winners over all alternatives for a high-performance TIM. Feel free to visit our Reviews page for additional independent test results.